It’s impossible not to fall for this miniature Champagne sparkling blush and scarlet red lipstick duo created by Nars and inspired by Man Ray. Small but perfectly formed, they make glamour on the go a cinch. 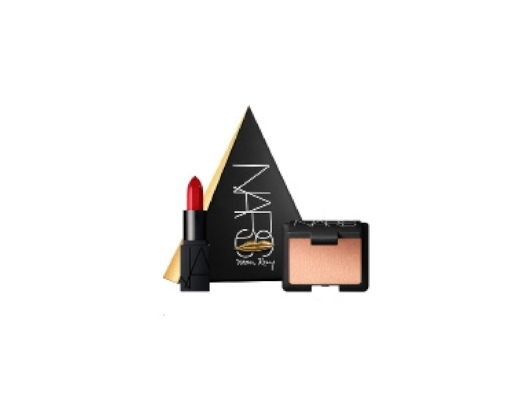 NARS X Man Ray Love Triangle Blush/Lipstick Set, $32, at Sephora. With Honey Drop lightweight moisturizer, Honey Potion antioxidant-packed mask and Sleep Tight firming night balm, this is the perfect gift set for fans of honey and lovers of sleep. Combine the two and it adds up to radiant, youthful-looking skin. FARMACY Honey Harvest Gift Set, $58, exclusively at Sephora and Sephora.com. This golden brush set will make applying makeup feel more glamorous than ever. Whether displayed on her vanity or kept in her purse, they’ll add a touch of luxury to any look. QUO Golden Brush Set, $17, at Shoppers Drug Mart. Saje Best of Saje Deluxe Wellness Essentials Gift Set, $100, at Saje and Saje.com. French skincare line Sisley brings its signature decadent touch to its Rose, Tuberose and Champagne candles, which are packaged as a limited-edition set for the holidays. Made from chic black wax and housed in a matte coloured glass, they bring a moment of bliss before you’ve even lit them. SISLEY candles, $90 each or limited edition set of 3, $250, at Holt Renfrew.